Now y’all know that Valentine’s Day is mainly geared toward women. I did a search of key words online before writing this post and the phrase ‘Valentines Day Gifts For Him’ is searched on Google over 39,000 times. The phrase ‘Valentines Day Gifts For Her’ is only searched on Google less than 2,000 times. This could mean one of two things: Either men prefer to shop in brick & mortar stores for Valentines Day, or they just don’t obsess over it nearly as much as we women do. Because we women are so darn conscientious and thoughtful, I decided to put together a set of gift ideas to make it a lot easier for you. This will save you precious time searching online for ideas. You can just cut to the chase. Love Vouchers – Treat Your Loved One to the Best Gift of All – Your Time! Chocolates – Chocolate Red Foil Lips, Decadent Chocolate Cherries, Chocolate Red Nonpareils, and Heart Shaped Pretzels with a White Coating and Red Nonpareils. All Comes in a beautiful Benevelo gift box with ribbon ready to be given to your love with love! Beard Oil – Honest premium beard care. Great for dry, itchy beard. Orange Cedarwood. All natural jojoba, argan, grape seed, & coconut oils. 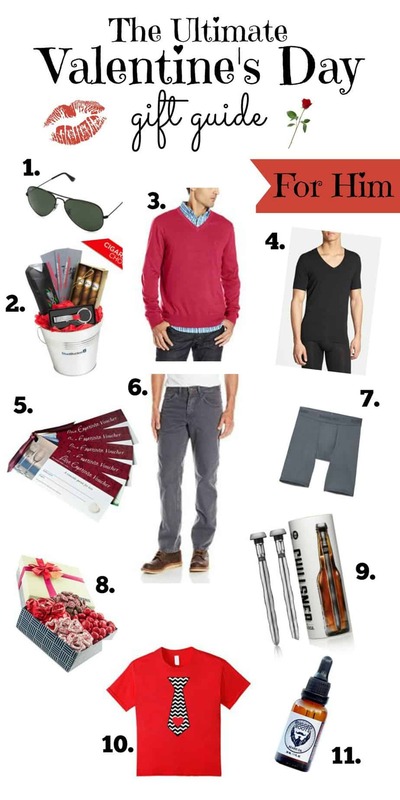 I personally LOVE everything on this list and want to get it all for my hubby. All of these items get great reviews on Amazon. If you’re a guy reading this, go ahead and share it with your significant other, circling exactly what you want.